While we wrote an article on promoting Earth hour for the cause of better environment and a move against climate change. We were not just writing but celebrated this day in our own style. While the whole staff turned their lights off at 8:30 PM (local time) we also darkened our website to save electricity. Did you know that white screens consumes more power than black screens? Still white is favourite of all the major websites, as it looks simple and easy to read. So, The World Reporter contributed this way not just for an hour but for the whole day. Saving 5MW, small but still a big contribution. We loved the response by the readers, and are happy that many are concerned about climate change, we saw 19% increase in our total facebook like, and 11% rise in total RSS subscribers. Thanks for your response, it motivates us to write more. So, the earth hour is over on a worldwide basis but let us still celebrate it individually and contribute daily too. As we all know that on July 1, Google will be closing its one of the very useful service, Google Reader. We request all our RSS subscribers to shift to your new readers or softwares and stay connected with all the latest reports and opinion work on The World Reporter. Thanks for staying with us. We want to provide you seamless connectivity and interactivity with our free services. Everyone has an idea, everyone has a thought. Some put their thoughts in front of the public, some write in their diary and some do nothing and move on. Lack of easy access to journals and newspaper’s editors and lack of knowledge on how to get published is one of the major reason why most of our thoughts remain within a barrier. Like progression of energy needs some medium, progression of thoughts and opinion needs a medium through which it can travel to people’s mind. Journalism is a passion. You have to be dedicated, unbiased and should have love to write, if you are seriously looking forward to pursue journalism as a career. Everyone has a journalist inside him. Though good writing skills are required, but one doesn’t have to be master in Hi-Fi English, or any other language. And what are Editors for? But if journalism or writing is just a hobby, like most of the people who don’t have any degree or certification, then it can get little difficult getting published on newspapers or big journals. The World Reporter, being a student journal always encouraged public and students to get published. A website dedicated to student journalism is a platform for getting your general ideas published. Founded and maintained by the students from around the world, The World Reporter is listed in Lund University and South Asia Studies Network, Sweden as a useful resource. The World Reporter has also been a platform for a Management Research Project with the students of Academia de Studii Economice, Bucharest (Romania). The thing which attracts students and self journalist to The World Reporter is that we don’t report news like other websites or newspapers, but we put forward our opinion, our analysis and research to the public. News Opinion and Analysis is the section of journalism where journalists explains how a news event can change our life, or what can follow this. Such journalists generally comes with an answer of what will come next? If you came here looking for expressing your words then you can write to us at [email protected]. Our Editors will revert to you and provide you the gateway to get published on The World Reporter. You can send your sample work and follow our submission guidelines to get approval quickly. 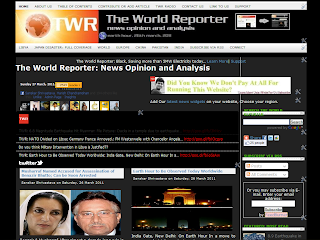 With more than 200 articles in our archive The World Reporter is growing stronger. In this growth we want to take you along with us so that we grow mutually. Our SEO team has released downloads both for your browsers and websites which helps increase your website’s Alexa rank as well as increase quality content on your website increasing your search rank. If you don’t have a website you can simply install our other extensions and gadgets to stay connected with The World Reporter on the move. Keep on reading further and you will surely find attractive things for your browser to stay connected with TWR. The Toolbar is for Internet Explorer and Firefox only, besides boosting your Alexa rank it also helps you surf by displaying the alexa rank of each websites in Google search as well as on the browser. The higher the ranking the better is the website. The toolbar also lets you stay connected with latest news, latest articles on The World Reporter, Your Facebook, and Twitter account and notifies you of your new mails and gives you easy access to your inbox. This is for those who can not install our toolbar as they are Chrome Fans, Our Chome extension is a very light and small app and hardly occupies any area in your browser, thus keeping your browser window clean. The extension updates you of any new article on TWR with a brief summary, it gives you option to subscribe and to easily access an article anywhere from the web. Do you want to show the latest happenings around the world on your website? Then this widget is for you. Download the codes, copy and paste the codes provided by us on your website to display news on various topics and news of various regions. Displaying news will not only keep keep your visitors updated about latest happening but will also add up to your content of the site. And all this is for free.